Forerunner 735XT has built-in Elevate™ heart rate technology to measure heart rate at the wrist1. That means you can run freer when it's time to toe the line. No need to wear a chest strap to see your heart rate zone and beats per minute in real time, displayed on a colorful gauge. 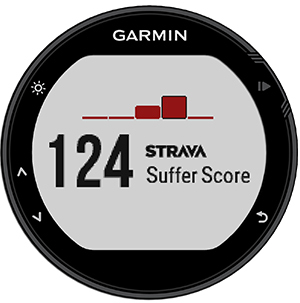 Smart notifications, automatic uploads4 to Garmin Connect and live tracking make 735XT the ultimate smartwatch for athletes. Keep your phone tucked away when you're on a long ride or run, and get all your notifications at the wrist so you can decide to respond or keep moving. Also, with Garmin Connect™ Mobile's ability to share your runs and workouts, cheerleading doesn't just take place at the sidelines anymore. Your friends and family can view and comment, no matter how far away they are. You can even customize your device with free watch faces, apps and data fields from Connect IQ to really make 735XT yourwatch. Get more from your miles at Garmin Connect, our free online community where you can save, plan and share activities. Beat yesterday by nailing a new PR — we'll keep track so you can view your victories all in one spot. Get digital insights tailored to your stats and habits, like cues to move and healthy tips. Connect with other users to challenge and compete. Available on your compatible mobile device. Just like you, Forerunner 735XT goes hard, all day long. This watch becomes your partner in recovery with all-day activity tracking that monitors steps, calories and sleep. It's also compatible with our line of Varia™ cycling awareness devices, including rearview radar, smart bike lights and Varia Vision™ in-sight display. When used with HRM-Run™ or HRM-Tri™ monitor; included with some models, sold separately on others. 3When used with a chest strap heart rate monitor. When used with HRM-Swim™ or HRM-Tri monitor; included with some models, sold separately on others. Available to Garmin Connect customers who are using activity tracking features. Watch functions Includes date and alarm.